So as a music lover, I asked for, and received a couple new CDs this Christmas season. Now on this album, there was a sticker on the front that said something along the lines of '7 albums in 7 years! '..which at first I thought was an amazing feat and really cool. But honestly after listening to this album, I sorta feel like it was rushed. Like it was just made in order to keep this streak up. Not saying that it was a horrible album, but nothing really struck me. Yes, Diamonds, is currently on the radio and it's pretty good, but a lot of her music is kinda slow and crass which isn't my favourite from Rihanna. The song that really hit me and made me turn up the music, was of course the most controversial song on the whole album, 'Nobody's Business' with Chris Brown, who unless you've been living under a rock, you know is the ex-bf who abused Rihanna. A lot of people have, or are going to have an issue with this song, but from for me, from only a musical point of view, this song had attitude, had a great beat and you can't dispute Chris or Rihanna's quality of voice. Anywho..that being said, this may be another Rihanna CD that I'll have to listen to a few more times before I really enjoy it. But my advice would be to take a break and not push to have 8 albums out in 8 years...music is all about quality, not quantity, in my opinion. So when I first started hearing about this album, all I could hear was great things and how amazing every new song was and such (There are really only like 7-8 new songs on this 3 disc CD). I was really excited because I am usually really pumped for Nicki Minaj music because of how 'power' she is and how original she is. These new songs were alright, but for some reason I didn't get hooked until song 7 of this first CD and song 8 was a repeat from her last Roman Reloaded CD. So let's talk about the music...Song 7 entitled 'The Boys' ft. Cassie is a very interesting kind of song. It starts off pounding and strong and rap filled, then it kinda mellows out a touch and then finally goes into a sort of ballad type form. It's like a rollercoaster for your ears, but because of the start, I found myself switching to it all of the time! The 8th song which is 'Va Va Voom' was actually on the Roman Reloaded CD that I got earlier this year. 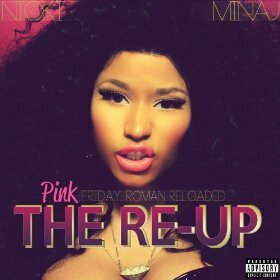 It's a really good song, very upbeat and very Nicki. Just found it kinda odd that they included it in this new release set, but oh well, music biz for ya. So after those two reviews, I honestly gotta say that I wasn't blown away by either album...that being said, they will still stay in my car and I will probably learn to love both of them equally. P.S. - I'm super excited to buy new CD's with the HMV gift card that I got too!! Any recommendations?? I'm not sure why that is..maybe it's because I'm not a super duper intense love to write person...like when I was younger, I'd start journals all the time..go steady for a few days and then forget about them...just not a huge writer. Like I know that some people love to write and feel therapeutic when they do, but I'm an oral person so I like to say things out loud in order to express myself..probably why I 'talk to myself' ;). I'm really going to try and stick to a schedule of blogging in 2013!! And not pressure myself to feel like I have to write something revolutionary in every post...I think that may be why I don't write as much...I feel like each post needs to be therapeutic, refreshing, funny, great, insightful and just fabulous..which is sooooo not realistic!! I got a great plaque for Christmas that I cannot shut up about and it's words reasonate so much with me. I think I am going to use it as inspiration for my upcoming year. What great, simple words. Gosh fits me so well. Such hope in just five little words. Anywho! I'm going to post this as it is because it's pure and it's me :). Much love from me to you and have a safe new year!